We are a noteworthy manufacturer, exporter and supplier of a comprehensive range of GSM Enabled Vending Machine Control Panel that is used so that transactions can be viewed at home. Our provided control panel is manufactured under the vigilance of our adept professionals using the finest quality component and sophisticated technology in sync with set industry norms. Apart from this, our offered control panel is sternly tested by our quality examiners in order to ensure its durability. In this project, the RFID module reader typically contains a module (transmitter and receiver), a control unit and a coupling element (antenna). 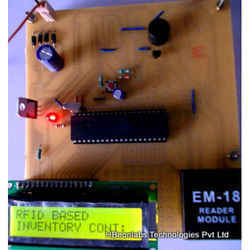 This module is interfaced with the micro controller and when the card is brought near to the RFID module it reads the ID CODE in the card and then compares with the ID CODE of that present in the system and if it matches then the door gets opened in clock wise direction and the person gets in and after sometime the door gets automatically closed..Then to access your bank i.e., any transactions to be done then in the system you need to enter your user id and password using KEYPAD then if it is success you can access in the way you like to do. If the password is not matching then he will be given only 3 chances after that, system gets into blocked mode and it indicates this with a buzzer. For an unmatched card, it alerts a person around by giving a sound through a buzzer The significant advantage of all types of RFID systems is the non contact, non-line-of-sight nature of the technology. Tags can be read through a variety of substances such as snow, fog, ice, paint, crusted grime,and other visually and environmentally challenging conditions, where barcodes or other optically read technologies would be useless. 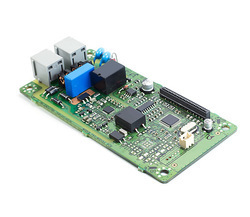 This project can provide security for the industries, companies , etc .This project uses regulated 5v, 500Ma power supply. 7805, a three terminal voltage regulator is used for voltage regulation. Bridge type full wave rectifier is used to rectify the ac output of secondary of 230/12v step down transformer. The RFID module requires a separate +5v power supply. RFID tags are comprised of a tiny microchip which is attached to an small antenna.Basic RFID tags can be as large as a 4x6" label or as small as quarter and usually cost anywhere from 10-cents to a dollar once integrated into an adhesive label or package. More advanced tags can have sensors and batteries attached to enhance their functionality and read range but are more costly. To read the tags, RFID readers emit radio signals that prompt all of the RFID tags within range to respond with their unique IDs in rapid sequence. The reader then passes this information on to be looked up in a local database to determine the product's identity. In many cases the unique ID stored on the tag is an Electronic Product Code (EPC). EPC numbers are passed to the EPC network which, in turn, will identify the product manufacturer, product type (SKU), and can provide updated tracking information.Please contact Bastian (BMH) to commission a pilot RFID program to put our expertise to work for you. We can answer your most difficult questions including those about compliance, visibility to your supply chain, and costs. RFID is very useful Technology for Blind man to Identify the things like Buses, Trains, Railway Station and virtually anything we can think about. We can embed the RFID reader in Blind man stick and put the RFID tags on other things to identify them for the blind man and blow a siren or a prerecorded voice for each item which has RFID tag on it and is in the database of RFID reader of the blind mans stick. Radio-frequency identification (RFID) is an automatic identification method, relying on storing and remotely retrieving data using devices called RFID tags or transponders. The technology requires some extent of cooperation of an RFID reader and an RFID tag. An RFID tag is an object that can be applied to or incorporated into a product, animal, or person for the purpose of identification and tracking using radio waves. Some tags can be read from several meters away and beyond the line of sight of the reader. 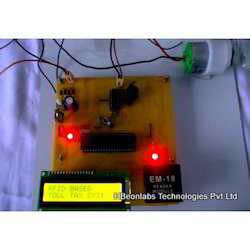 This kit includes Low Frequency RFID Reader and tags working at 125 khz frequency to fetch the information from the vehicle/train/railways station or any object to process it through microcontroller. Then microcontroller will receive the information from RFID Reader and detect the object from RFID tags connected to object and play the prerecorded sound for that particular object. 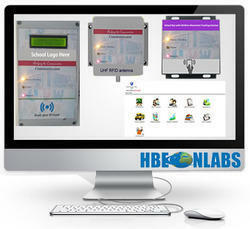 The amount deducted will be displayed on the LCD display along with the Vehicle number. Each vehicle will have a unique RFID tag to identify it. 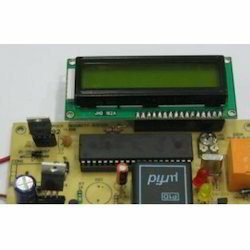 The method used to carry out this project is the principle of serial communication in collaboration with embedded systems. This is a very good project for Industries.This project has a RFID BASED LIBRARY MANAGEMENT SYSTEM, which will be used as the electronic device, and also a RFID reader, which is the latest technology used for identifying the object. When an object comes in front of RFID reader, the reader read the information about object from its unique RFID Tag and record into database .basically it has three component antenna, transceiver and transponder. So these are components that perform the whole task .when a signal is sent by antenna it return back from the subject and the signal detected and by this the reorganization process is performed. The main objective of the system is to uniquely identify and to make attendance for a person. This requires a unique product, which has the capability of distinguishing different person. This is possible by the new emerging technology RFID (Radio Frequency Identification). The main parts of an RFID system are RFID tag (with unique ID number) and RFID reader (for reading the RFID tag). In this system, RFID tag and RFID reader used are operating at 125KHz. The Electronic Road Pricing (ERP) scheme is an electronic toll collection scheme adopted in Singapore to manage traffic by road pricing, and as a usage based taxation mechanism to complement the purchase-based Certificate of Entitlement system. A device known as an In-vehicle Unit (IU) is affixed on the lower right corner of the front windscreen within sight of the driver, in which a stored-value card, the Cash Card, is inserted for payment of the road usage charges. When a vehicle equipped with an IU passes under an ERP gantry, a road usage charge is deducted from the Cash Card in the IU. Sensors installed on the gantries communicate with the IU via a dedicated short-range communication system, and the deducted amount is displayed to the driver on an LCD screen of the IU. Coming along with the urgent development of wireless technology, wireless devices have invaded the medical area with a wide range of capability. Not only improving the quality of life of patients and doctor-patient efficiency, wireless technology enables clinicians to monitor patients remotely and give them timely health information, reminders, and support – potentially extending the reach of health care by making it available anywhere, anytime. With the Help of RFID the doctors and hospital can keep the record of patient with Unique Identification Number provided with RFID card to him. Whenever the patient want to meet the doctor then the patient can carry his RFID card with him then the doctor will swipe his card to the RFID reader to find his history of disease or medical report on his database. It will help the hospital to manage the patient appropriately and provide them better treatment. 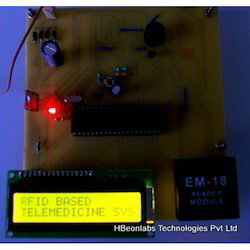 This kit includes Low Frequency RFID Reader and tags working at 125 khz frequency to fetch the information from the patient to process it through microcontroller. Then microcontroller will receive the information from RFID Reader and display the record of the patient on LCD display connected to it. Each patient will have a unique RFID card to identify it individually and display his/her record on LCD. The architectural implementation of the system and the main end to this system is to allow the consumer a new way of shopping. When arriving at the supermarket, the consumer heads towards a shopping cart that has a technological system on its handle-bar which consists in a touch-screen monitor a client card automatic reader,a positioning transmitter and a product reader. Nevertheless, all these technologies become transparent to the consumer because only monitor interaction will occur.Through the client card, the consumer logs in to the system; the system then welcomes the consumer and displays the shopping list. With the help of the shopping carts navigation system, the client is directed to the locations where the products in the shopping list can be found. The client places the products in the shopping cart the usual way and begins to receive multiple information: the products found inside the cart; the ones missing; total paying amount; total promotion al savings; product details; amongst others. This project RFID based home security is developed to build a security system for a home/office to prevent the other persons to enter into the important room/chamber by controlling radio frequency identification by checking a suitable RFID card. The RFID tag gives the unique id whenever it reads the card information. 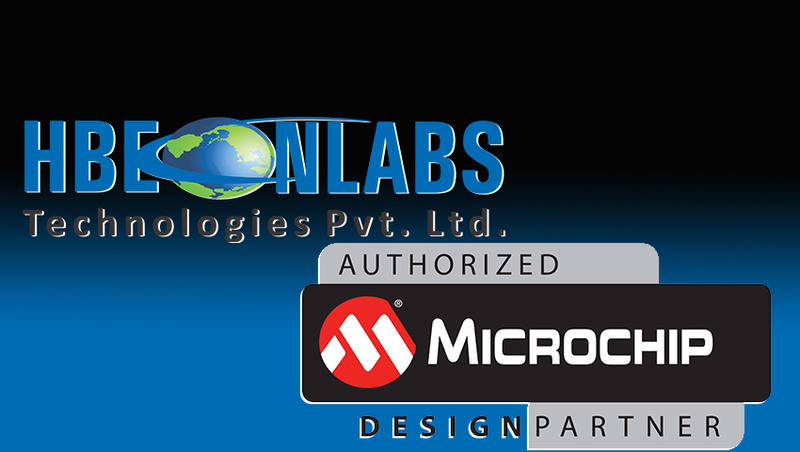 This id information is send to the micro controller to check the correct card to take a security action. If the card id matches with the original information, it allows entering into the room, if not gives the buzzer as an indication of wrong person tried to enter into the room. In present system there are no efficient methods for accurate identifications, there are certain places where accuracy is important mainly in banking, health care and government sectors. This application will provide RFID tag based system which uses micro controller. Railways are one of the most important modes of travel all over the world. So, all their operational procedures have to be simplified for deriving the best results. One such technology employed for providing the best service by the railways is the RFID railway reservation technology. It simplifies the process of the movement of the passengers without causing any problems. The biggest benefit of such a system is in simplification of the ticket checking system. The ticket checking system now consists of a simple verification of the RFID tag which is possessed by the people. Also, this system is completely flawless and fool proof. With the employment of RFID, it can hope to get rid of its many problems like increasing capital expenditure and debt management. This technology can help such organizations like railways in consolidating their revenues while cutting costs through better operations and asset operation. The implementation of the RFID in the railways can provide knowledge about the exact location of a particular person or his luggage. 2 cahnnel RF wireless remote control, also 4, 6,8, 12 channel available, customise we do..